Don’t you just love it when an idea comes together? This is a project which went from a spark inspired by a random tweet to a firm world first in about three hours. There were two tweets which really inspired this. 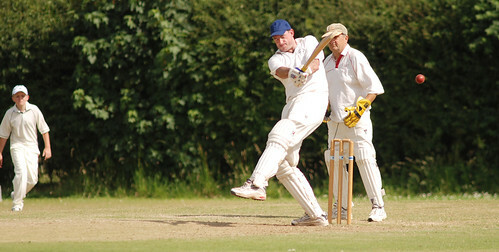 The first was from Dan Slee expressing his hopes for keeping up with a local village cricket team via twitter, the other was from Chris Conder (@cyberdoyle) as she tested the 30Mbps symmetrical internet connection her village now has access to, courtesy of Lancaster University. My twitter conversation with Dan centred on what a nice thing it would be if we could live stream video of village cricket matches. And then it occurred to me that this could indeed be possible if we had access to the sort of connection available in Chris’s village of Wray. So, the next step was a Skype call to Chris to ask if they had a village cricket team, and, if so, is the cricket field in range of the wifi network? The answer came back, that, yes there is a team, and that, although the field is not yet within range of the network, it could be a relatively simple matter to connect it up. Chris then told me that there is a special cricket match planned in Wray for Easter Monday as part of the village’s annual Scarecrow Festival (details here), this match is billed as Wray vs. the Rest of the World. So, the plan was hatched. 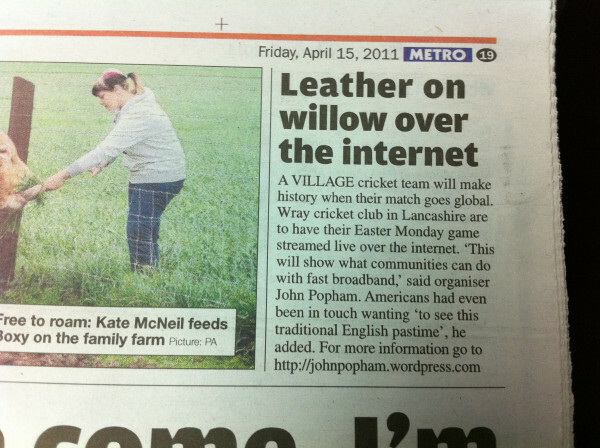 I’m pretty sure this will be a world first, a live internet video broadcast of a village cricket match. It’s gong to be a tall order to make this happen in a short space of time, but it can be done. And it can be done more smoothly with some finance, so I will be looking for sponsorship to help make this happen, please get in touch if you can help. I’m excited about this. It’s a bit of fun, but it has a serious purpose too. The serious side is to demonstrate that it can be done, it IS possible to live broadcast events like this using relatively cheap equipment and a good internet connection. It will also demonstrate the importance of good internet connectivity in rural areas, and the need for fast UPLOAD connections if we are to realise the aspiration to use the internet to enable more people to produce their own content. Watch this space for more details, I think this is going to be big. I have a caravan which I am planning to turn into a mobile social media surgery. It needs a bit of money spending on it to make it roadworthy, and I am also hoping to get some art students to paint the outside to make it eye-catching. If anyone is able to provide some sponsorship towards this, I could make sure their logo is incorporated in the art work. It would be good to get this done before the cricket match to it is available as a base to work from on the day. As the url of this post has been widely distributed (not least to Stephen Fry’s 2,446,087 Twitter followers – thanks Stephen! ), I am going to update the post from here as things develop. I suppose I wasn’t quite prepared for the amount of attention this idea would generate, but I am immensely gratified that it has. This is where we are at, only 36 hours since we started with it. Thanks again to everyone who has offered support for the event. I’m meeting with the good people at Aquila TV on Friday afternoon, and, after that, should have a better idea of what is technically possible. Then I’ll be able to respond to your offers. There were a few connectivity issues, which Guy Jarvis at NextGenUs is going to sort out for us this week. I broadcast the video below live from Chris Conder‘s farm which demonstrated that Chris’s connection was more robust.